Extra-length foot-operated type impulse sealer, FiF series allows film to pass through the sealing area, making it possible to seal other than the end on a bag. FiFseries can be used for processing block-bottom bags or sealing tube type films. No special skill is required to operate this sealer. Use the timer to adjust the heating time for the material and thickness of the packaging material or bag to be sealed, and lightly step on the pedal to create a clean, strong seal. Because film and bag can pass through the heating area for sealing, a seal can be created on locations other than the end of a bag. This allows the sealer to also make simple bags. 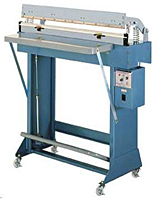 The FiF series of sealers comes standard-equipped with a table convenient for sealing operation. Fuji offers a comprehensive lineup of models to accommodate a variety of bag sizes(widths), thickness and materials. Different models are available for seal lengths of 1000, 1200 and 1500mm (3.3, 3.9 and 4.9ft), as well as for seal widths of 5 and 10mm (0.19″ and 0.39″). In addition to a single-side heating type capable of sealing materials up to 0.3mm/ 11.8mil thick, there is a double heater type capable od sealing thick or laminated bags up tp 0.4mm/ 15.7mil thick. C type is equipped with a cutting mechanism to cut excess bag (film) ends. Slide the cutter knob sideways in either direction to cut the tube-shaped film after sealing it. 10C type uses a cutting heater to cut through the centerline of the sealed area. It can be used to seal and cut apart the tube-shaped film at the same time to make bags. Melt-cut type can be used for processing bags in which a round-wire melt-cutting heater is used to cut the bag (film). Although the melt-cutting heater slightly fuses the film together, there is hardly any sealing strength. Electric-operated type of FIF series, FIF-A series also available!! FiF-A series is semi-automated version of FiF series, with an easy foot-switch operation. As an air source, please prepare the compatible compressor with the following capacities.